I have been brave these last couple of weeks and ditched the wigs completely! Well, it was getting warmer - and my own hair is growing back so thick now - it was poking out anyway. 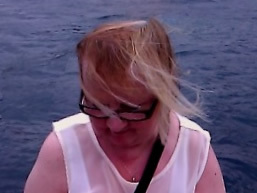 Just look at the difference between last July in Slovenia - when my hair was hardly there at all! (I chopped it all off when I got back from this holiday) and now. It has surprised me how dark it has grown back - and how curly. I have to straighten it to keep it under control! ﻿﻿There has been quite a reaction - in fact many of my customers have walked in and then right past me without saying hello - only to be surprised when they come to be served. "Oh it is you!" they exclaim "I thought they'd sent someone from Newcastle!" 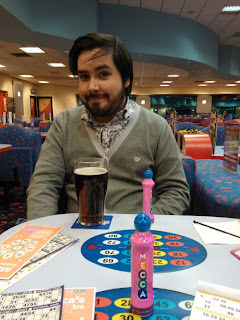 March 2013 - thick hair! I was quite cheered to find out how many of them had not realised that I had been wearing wigs. I thought they were pretty obvious - and felt rather self-conscious wearing them. But it seems that most people were oblivious to the fact. I needn't have worried! It's nice to be back to me now - all natural. There are even some grey hairs in there too! Must have been the stress :-) I'll keep growing for a while and see how it looks. I'm not allowed to put chemicals on it for 12 months. I might like it by then!! Have been busy at work over the last week or so. Of course the schools were on holiday so the library has been full of young people. On the whole they were pretty good - if rather noisy! Seems peaceful again now but it was good that they think of coming into the library. Even when the computers were busy they still found things to do - reading the Guinness Book of Records and the latest bio of Tom Daley seemed popular - as well as colouring in - meant for the younger ones - but seemingly popular with teens too! Also the Parish Council work has been a bit manic too - with the end of year accounts to sort out. Soon I will be off to see the dreaded "Internal Auditor" with my books and spread sheets. I remember doing it last year - and feeling so ill. I had to wear a big scarf because all my neck was peeling off from the radiotherapy. Don't worry - I won't be putting that photo up again!! It's the worst thing I've ever seen :-) This year I feel a lot more on the case! Had a bit of a shock when we came back from shopping one day last week. There was a note through the door - a little like one you get from a courier when you are not in. Oh no - we though - we've missed a parcel. It was close to Laura's birthday and we were expecting a few things. 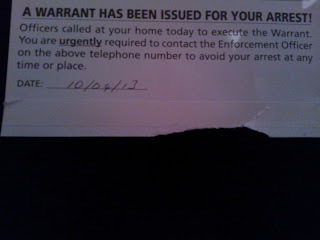 But when we opened it up - it was a warrant for arrest! It was addressed to someone whose name we'd heard before - and we realised it was meant for someone who lived on a road with a very similar name to ours! We often get post, taxis, curries and pizzas arriving at our door - which are meant for them. Having read the message we thought we'd better ring them quickly - so they didn't try again by battering the doors down in the middle of the night! 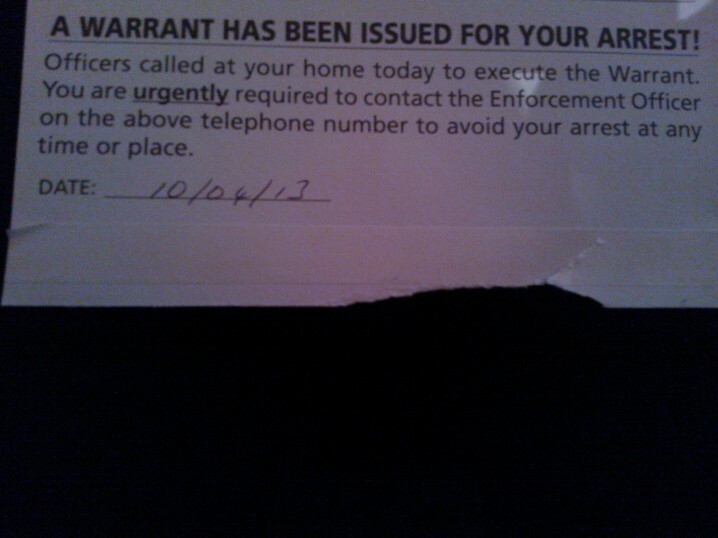 Who knew they actually warn you they have been to arrest you. Surely most people would skip the country??? Nathan rang the number on the card - and they quickly realised that they had been to the wrong house. Even though we thought it was really funny - they didn't seem to. Perhaps they were a little embarrassed. Anyway - I will stop for now. 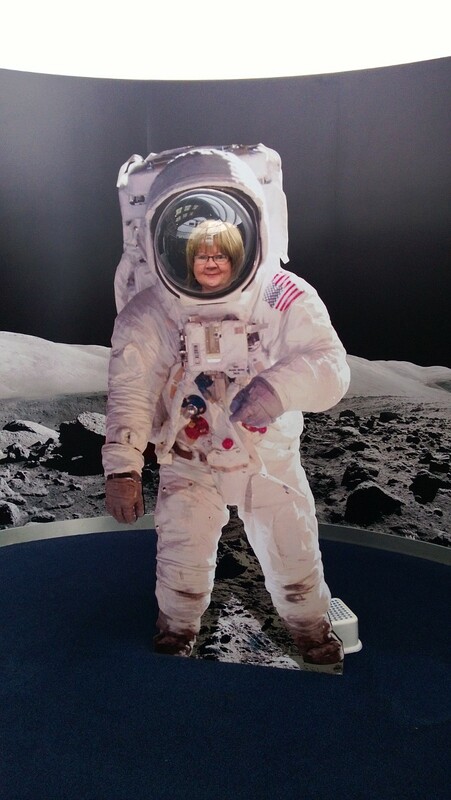 I leave you with a photo of me as an astronaut that I have now retrieved from Nathan's phone. I am feeling pretty excited! I have registered to do the Race for Life at Trentham Gardens on 11th June. Not only have my good friends Janet and Tracy agreed to do it with me - but we have also been joined by Dawn - Tracy's sister. It is going to be fun! The serious part though is that we will be raising money for Cancer Research. I don't have to tell you how important this is to me. Although I am now cured of my secondary cancer thanks to the wonderful staff from the Cancer Centre at the University Hospital of North Staffordshire. None of us have any idea where the Primary Cancer started - or went to. So it is a bit of a worry. Much more research is needed into CUP (Cancer of Unknown Primary) so that treatment can be more targeted and specific. We are aiming to raise £50 each - a total of £200. If you could spare anything to help us reach our target we would be very, very grateful. Cancer - we're coming to get you!!!! We finished off celebrating N's birthday last weekend when his friends were all up for Easter. He wanted to do something a bit random - that he hadn't tried before. 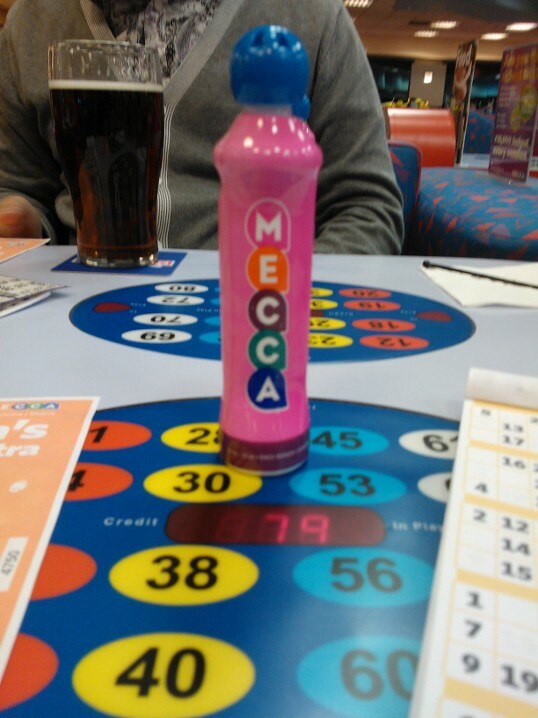 After much thought he settled on bingo! ﻿﻿So last Saturday afternoon we took ourselves off (with Mr M and Jo) to Mecca Bingo and joined the club! 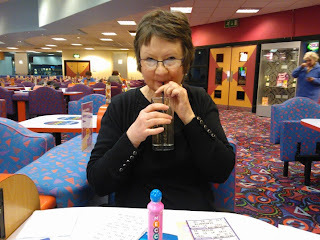 We were just in time for the afternoon session and we were given "Easy Cards" which meant that each page had 6 bingo cards which contained all the numbers. So as the caller called out the numbers - we knew that each number was thee somewhere once. It didn't help too much - as the caller went so fast!! No more "Two fat ladies - 88" its all "8 and 8 - 88, 3 and 4 - 34" etc. We did have a bit of trouble keeping up! All the old ladies were way ahead. Eventually we realised that the numbers were in columns - and the actual number being called popped up on a display on the table! We did get into it - and it was a good laugh - but not one of us got so much as a line! We were very proud of our lovely pink dabbers though! 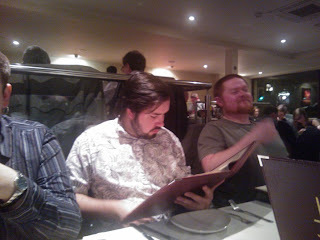 That evening we got everyone together for a few drinks and a curry at Jalsa. it was nice to see the others. Danilo came down from Edinburgh and Si and Heidi came up from London. Thanks for coming guys - it was great to see you and we had a really good time! So tomorrow I am off to the hospital for a check-up. My first in two months! I guess by now that Dr Gahir has had her baby. I don't know who I will see - but I am hoping that we'll be able to catch up with Frank in the waiting room.